The threat of major new flooding on the Missouri River is receding this week, but the stage is set for further disaster as the usual spring flood season dawns in the coming weeks. Last week's flooding left billions of dollars of destruction in its wake. Baker’s an earnest man with grey hair and lively eyes. On Sunday, he couldn’t get anywhere close to his family spread. He's seen lots of floods, but only one deeper — in 1993 — and none more foreboding. It’s the same feeling even where the levees held, a few miles downriver in Farley, Missouri. “The river’s crested and it’s dropping, and so the threat of a rise has past, but the river’s still high and so we need to keep our eyes peeled,” said farmer Joe Attema, pausing from his work filling sandbags. Attema and other volunteers in Farley weren’t plugging gaps in levees, they were stockpiling sandbags on pallets as insurance against future needs. Because though the Missouri River was at bay there, they fear another catastrophe is only one big rainstorm away. “With the river high, all the flood gates are shut so there’s no place for the water to go,” Attema said. This precarious situation is also top of mind a couple of dozen miles farther downstream at the emergency operations center of the Kansas City District of the Army Corps of Engineers, temporarily set up in a windowless room on the first floor of the Federal Building in downtown Kansas City, Missouri. On Sunday, Jud Kneuvean, the Corps' chief of emergency management, faced two enormous maps projected on the wall showing color-coded trouble spots along 500 miles the Missouri River. The Corps of Engineers built some of the levees on the Missouri, the ones protecting larger towns, and some protecting fields — those are considered federal levees. Non-federal levees are those built and maintained by private landowners, often acting as part of a levee district. Kneuvean said the Corps will start triaging shattered levees along the river as soon as possible to fix the gaps exposing the greatest numbers of people to further flooding. But he said it’ll take weeks of drying to even begin to assess the damage. In the meantime, Kevin Low, a hydrologist with the National Weather Services’ Missouri Basin River Forecast Center, said streams running into the Missouri are high. Two major rivers in South Dakota, the Big Sioux and the White River, are flooding. He said the snowpack was heavy, and it’s held on later than normal into the spring. What’s more, the soil across the upper Midwest is too wet to absorb much more water. And to top it all off, forecasters are predicting a better-than-average chance for major thunderstorms this spring. “And so, you might say we’ve got all the boxes checked, and now we just have to wait for the rain to come,” Low said. 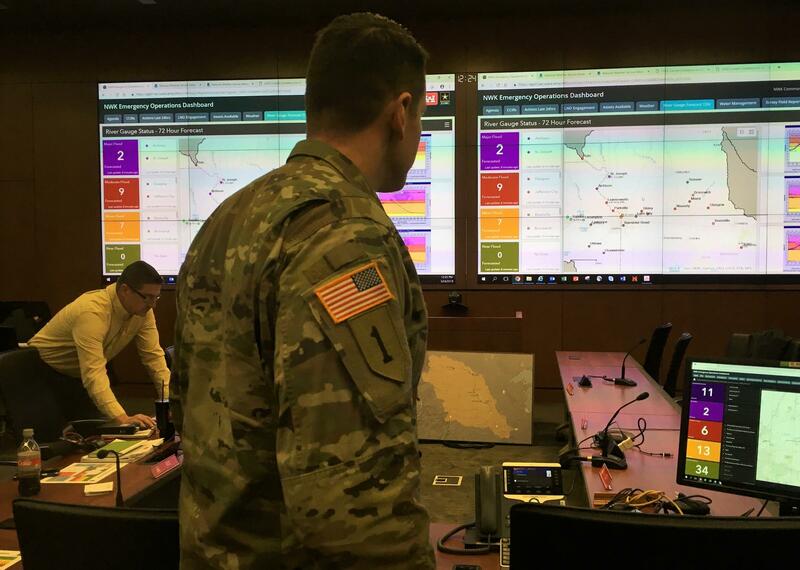 Low, the Corps and thousands of people living and working near the Missouri River will be watching the weather and worrying about flooding for months to come. Frank Morris is a National Correspondent at KCUR. You can reach him on Twitter @FrankNewsman. Copyright 2019 KCUR 89.3. To see more, visit KCUR 89.3.